Do you know after what time you realize that a movie you’re watching is the most amazing one you have seen in a while? Or the story you follow is the most adorable one? It happens when after having a long day of work, analysis and stress, you go to cinema and after the first few minutes you feel yourself refreshed, reborn and ready to watch the movie like you have done nothing else during the day. 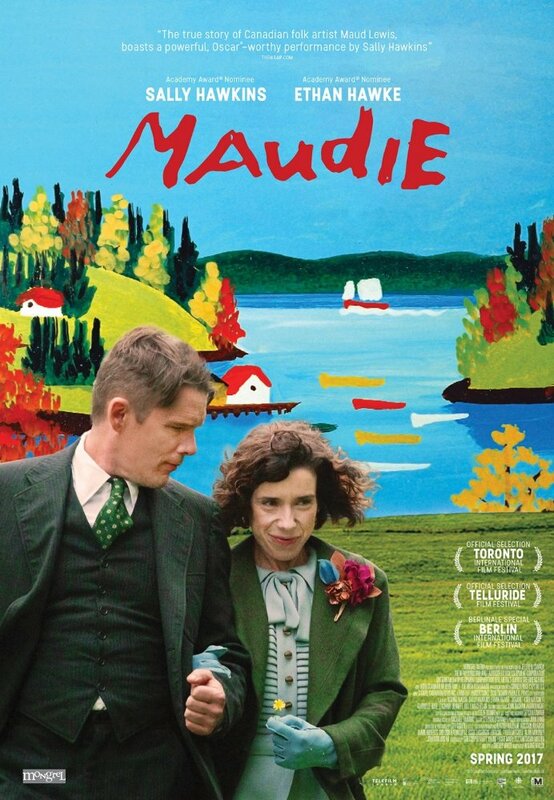 Maudie written by Sherry White and directed by Aisling Walsh and based on true events explores an inspiring story of a woman, Maud, who despite her disability hones the skill of painting and becomes a respectful figure in the community of a little town of Nova Scotia. Her story might be far from being a fairy tale, but it is something that should be seen as an urgent matter because what it delivers is outstanding, thoughtful and damn good. Maudie suffers from juvenile rheumatoid arthritis. Her brother Charles or her Aunt Aida (Gabrielle Rose) would not believe that she could have done anything on her own. But after seeing an advertisement on a local store, where a single bachelor, Everett Lewis, a fish peddler leaves a note stating that he seeks for a live-in or a house keeper, the life of Maudie changes completely after responding to that. Everett, as a man, was not an easy one to deal with. He had no manners, walks strange, and looks much older than his real age, thanks to Ethan Hawke’s charismatic and dedicated performance. At first, when he hires Maudie, he is rude and disrespectful. He acts like a child who is trapped in a grown up man’s body. But shortly after, he along with her, start proving that they both are capable of much more than they allow themselves. While you watch Everett becoming much nicer, it’s Maudie’s transformation from a dependant woman to independent, strong and determined is what will catch your entire attention, which eventually by getting back to her artistic nature, she will become one of the most known Canadian folk artists. The character development or the pace of the movie is something you will never question. During an approximate run time, which is two hours, you have enough chances to dislike Everett or cheer for him. But it’s Sally Hawkins, her incredible and a must-see performance which will blow your mind away. Kari Matchett as Sandra, a wealthy woman from New York is admirable and soulful. Overall, the performance delivered by the entire cast and of course by great Sally Hawkins is something you will regret missing. To conclude, Aisling Walsh picks the right cast for her movie, location and a strong storyline to make her movie one of the year’s best. It’s strong, well executed, has straight and uncompromising approach that makes the movie win at every level. But more importantly, it gives an excellent moral, teaches and strongly emphasizes that disability is not everything and not the end of the world. But it’s a key to concentrate a creative mind from outside distraction and do what, again, that creative minds asks. Maybe, if not for Maudie’s sickness, she would never become who she is… that, of course, is a huge speculation… but at the end of the day does it really matter when she was capable of doing something that most of us cannot? Hubby and I saw #Maudie on the weekend. 👏🏽! Fabulous. But we couldn’t catch what Maude said to her husband as last words, just before she died. What did she say? Do you remember?